THE TRUE STORY OF AMERICA'S MOST FAMOUS PAINTER OF THE JAZZ AGE . . . .
During the first half of the 20th century, an elite brotherhood of New York artists called the “Illustrators of Beauty” dominated the publishing world. Through their talent and hard work, they achieved fame and fortune. Young women knocked at their studio doors, hoping to be the next cover girl, but searching for fame and something much greater − immortality. The “Illustrators of Beauty” were the equivalent of modern day rock stars, and the dean of this group was Howard Chandler Christy. Christy had eclipsed all of his famous brethren with his “Christy Girl,” an idealized woman who redefined beauty, influenced fashion, and inspired a new generation of women. Illustrated in popular magazines, best-selling novels, and top-ranked newspapers, the “Christy Girl” transformed the artist into a household name. In return, showgirls, actresses, and budding starlets, yearning to be immortalized by his hand, lined up at his studio. Naturally, he invited them in – all 800 and more. An Affair with Beauty − The Mystique of Howard Chandler Christy is the first major biography about this influential American illustrator and portraitist who lived in an epic era in world history (1872-1952) spanning the Gilded Age through the post-World War II boom. During this time, Christy knew and captured the likenesses of some of the most powerful and famous people of the day, including presidents, movie stars, congressmen, generals, industrialists, princes and living legends. Yet, he never gave up painting his “Christy Girl” or his lifelong search for true beauty. Christy’s compelling story is a true nonfiction novel − a serial interpretative biography told in retrospect primarily through the eyes of his second wife, model, and muse, Nancy, the embodiment of the “Christy Girl” and a former Cosmopolitan model once considered to be one of the most beautiful women in America. 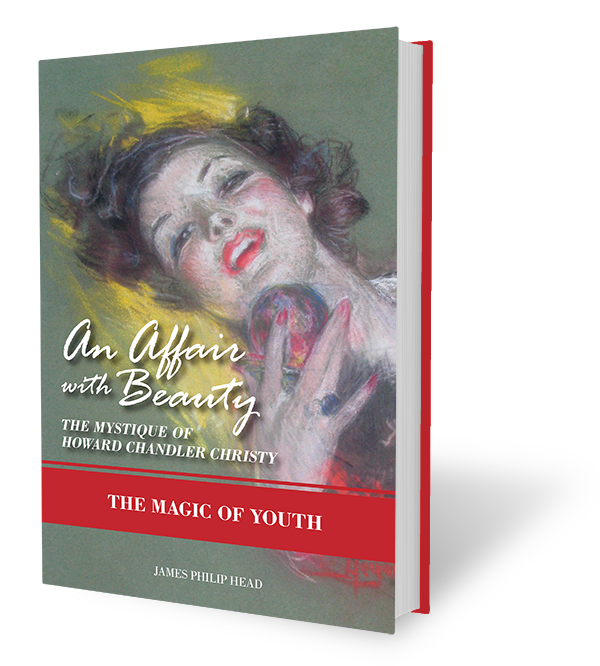 In The Magic of Youth − the first book in the An Affair with Beauty trilogy − Nancy’s story begins in 1969 during a walk in Central Park, where she reflects on the mysterious circumstances of Christy’s death in 1952, and then flashes back to 1912 when the two first meet and Christy becomes smitten with Nancy’s extraordinary beauty. As his new model, Nancy travels to his stately Ohio mansion overlooking the Muskingum River, near the place where he had spent his youth. In this newfound paradise, she learns of his idyllic, Mark Twain-like childhood as she discovers that things are not always what they appear and even the great Christy has scandalous secrets. But most importantly, she begins to understand that youth is fleeting and that true immortality comes at a much higher price than she had ever envisioned. 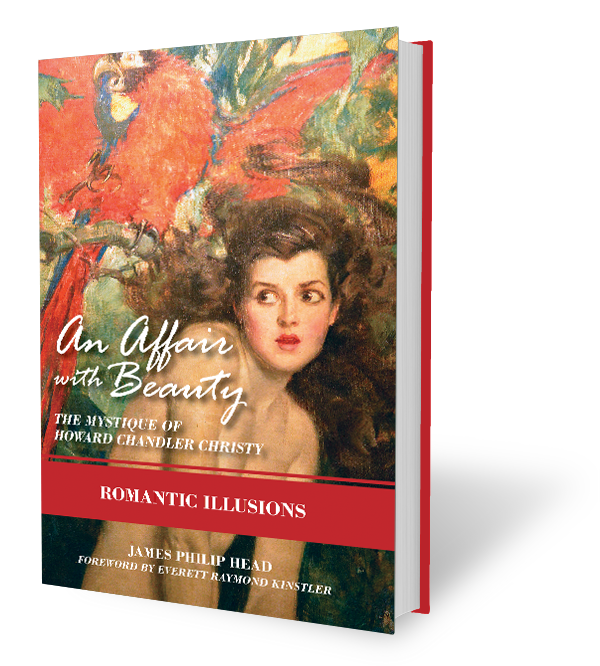 In Romantic Illusions − the second book in the An Affair with Beauty trilogy − Christy once again comes to life through the eyes of Nancy Palmer Christy, his second wife and former model, as she recounts her first Christmas with Howard and his family at his Ohio mansion, the Barracks, in 1912. Howard tells of his early years studying art in near-poverty in New York City and his sudden ascent to stardom as the top pupil of William Merritt Chase, the premier portrait painter in America. During "The Great Flood of 1913" − the worst −Howard describes his daring experiences with Teddy Roosevelt during the Spanish-American War in Cuba and his brush with near-certain death, no less than three times. The effects of the war profoundly transform Howard, inspiring him to create his vision of beauty, the "Christy Girl," which catapults him to stardom. When romance blossoms between artist and model, Howard is slow to seek a divorce from his estranged first wife, Maebelle, jeopardizing Nancy's desires and compelling her to uncover his scandalous past. As World War I break out, Howard returns to New York City, forcing Nancy to risk everything as she reveals her true feelings for him. "I have known Howard Chandler Christy for many years and have admired his work for even longer than I have known him. He was an outstanding artist and an outstanding citizen. He employed his brush and canvas to depict the real America. This nation will miss his genius and his patriotism. He was an inspiration to millions. He certainly was an inspiration to me." "In the course of American history millions of people have lived but only a few of them have risen to your eminence and your name will always abide in the annals of this land as one of the immortals." "He had such a warm, jovial personality: flamboyantly good-natured, boomingly cheerful. And if he liked publicity so much and was so good at getting it, well, I couldn't hate him for it. It seemed to go with his character. It fed him and he fed it . . . ."
Christy certainly had the most tremendous knack for it. Wherever there was a chance of it, there was Christy. You could count on it. If he wasn’t present, the occasion was second rate, doomed to pass unnoticed into the swirling mists of time. Later on at the beginning of World War II, I saw Christy in Washington. 'I guess the war is really on,' I said to my friend Mead Schaeffer. 'Christy is here.'" "I have to confess that I had had my misgivings about your being able to handle successfully my sort of types; I didn’t think you could do it, but by golly! You did! --- You did! . . . . With gratitude to you and your splendid work . . . ."
"I knew Mr. Christy very, very well from the 1930’s until his death. I didn’t know him as a very young man but as a great artist. He was among, if not the greatest, of all the industrial, religious and political leaders I have known." Washington Post: "Can you help fill in the missing provenance of a railroad safety painting from the 1930s?" Forbes: "The New Biography, 'An Affair With Beauty', Sheds Light On The Most Famous Painter Of The Jazz Age?" Parade: : "Who Was the Most Famous Painter of the Jazz Age?" New York Daily News:"Howard Chandler Christy Painted Beauty - And Ugly Cuban War"
The Capitol Dome: "'The Barefoot Boy of the Blue Muskingum'": How Howard Chandler Christy Won the 1935 "Battle of the Portraits; in the U.S. Capitol, Leading to Its Largest Painting - The Scene at the Signing of the U.S. Constitution"